File is a composite photograph of the Dalhousie Faculty of Medicine Class of 1969. Composite includes 49 individual portraits. Individuals identified on the sheet are as follows: Audain, V.P. ; Baird, B.G. ; Beaton, J.W. ; Benson, G.L. ; Byrne, B.D. ; Cameron, A.G.; Cameron, I.A. ; Cooper, A.R. ; Cote, P.R. ; Covert, A.A.; Cox, J.F. ; Craswell, D.F. ; Eaves, A.C.; Fraser, F.D. ; Garland, B.E. ; Gatien, J.G. ; Handler, M.B. ; Hickey, J.E. ; Hodder, D.G. ; Hollis, H.R. ; Hyndman, J.C.; Hyslop, E.K. ; Lantz, J.M. ; Large, D.F. ; LeBrun, G.P. ; LeLacheur, R.C. ; MacKeigan, J.M. ; MacNeil, C.W. ; McCormick, C.W. ; McLaughlin, A.W. ; Molyneaux, L.J. ; Myers, H.R. ; Newman, S.L. ; O'Connor, J.F. ; Parsons, A.H.; Pugh, R.E. ; Putnam, R.W. ; Ross, E.C. ; Roxborough, V.S. ; Rubin, S.H. ; Rubins, J.M. ; Sample, K.A. ; Sharpe, G.L. ; Smith, M.A. ; Wright, D.V. ; Tan, M.H. ; Thornhill, G.M. ; Tingley, R.A.; Yeoh, L.L. 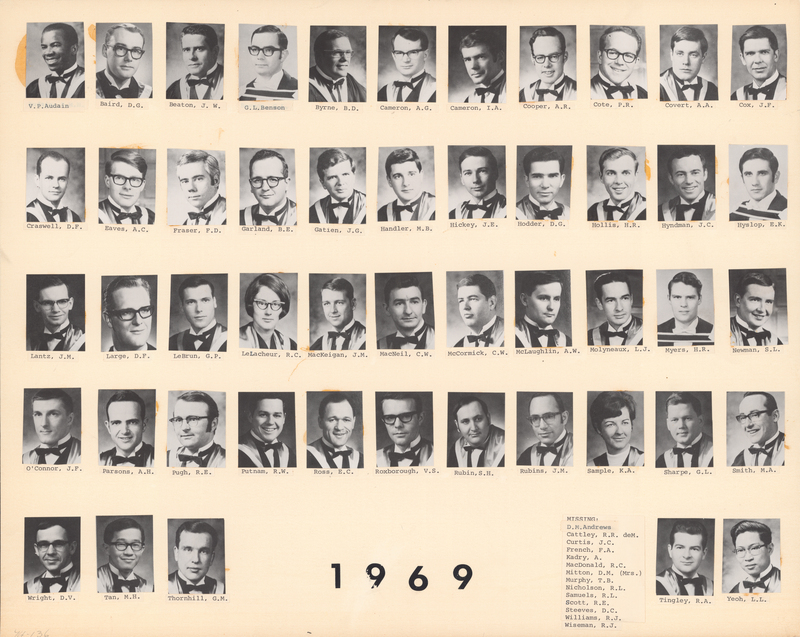 Composite photograph is mounted on cardstock with second composite on recto (PC1, Box 23, Folder 23, Item 1).